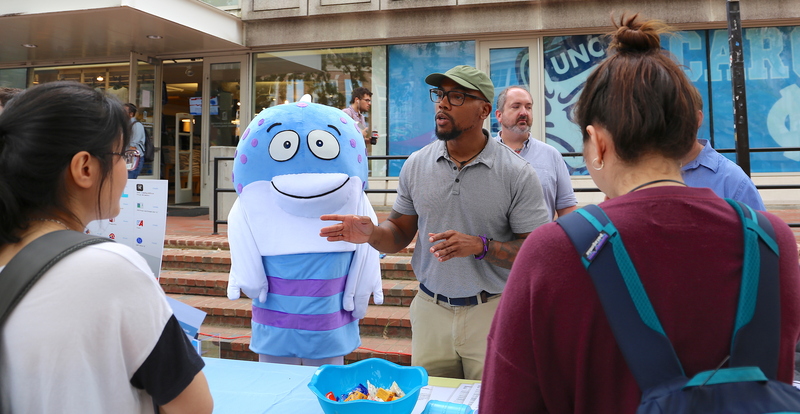 The third annual Tar Heel Tech Fair drew an estimated 600-700 members of the UNC-Chapel Hill campus community for free food, swag, prizes, information about tech services, and a visit with a 6-foot-tall plush fish. ITS organizes the Tech Fair each year for students, faculty and staff at Carolina to learn more about new technology services on campus and increase their digital literacy. Held October 8 from 10 a.m. to 2 p.m. in The Pit, this year’s event hosted eight University services and vendor partners Adobe, Lenovo and Microsoft. “We had some great booths this year from Lenovo’s VR system, to BeAM’s 3D printer, and lots of swag from Adobe and Microsoft,” said Tech Fair organizer Alison Campbell of ITS User Support & Engagement. “To entice attendees to the event, we purchased 60 pizzas, 23 dozen doughnuts, 80 pounds of candy, popped 120 bags of popcorn, and more than 200 cookies were generously donated to the event by Insomnia Cookies,” she said. A fun new addition this year was Mr. Phish — yes, as in stay safe online and don’t fall for phishing emails. The smiling blue-and-white fish costume was donned by a good-natured staffer from the Information Security Office who endured the heat and humidity to generate extra gaiety and promote cybersecurity awareness. To encourage engagement with all of the booths, Tech Fair organizers provide attendees with a card to get punched at each booth. 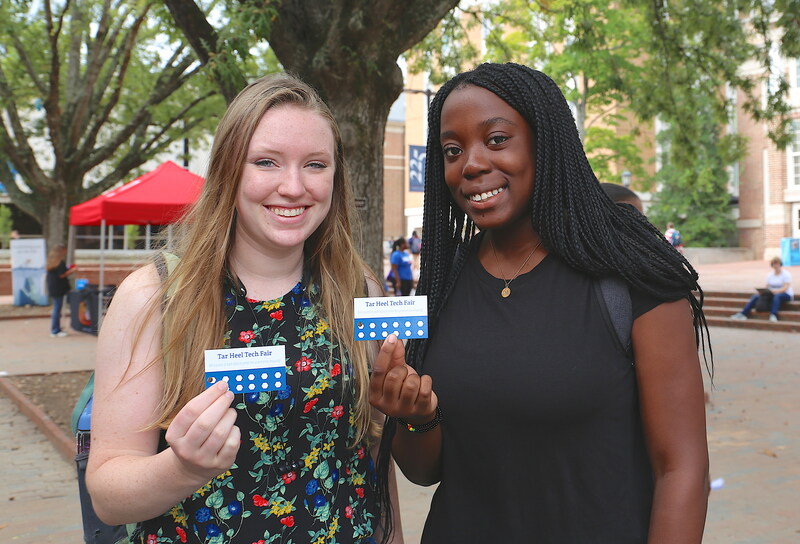 Of the approximately 600 cards that were handed out, 208 punch cards were turned in for the chance to win prizes. One lucky person received a grand prize while four lucky winners received gift cards and/or gift bags from donations by Lenovo and Adobe. Donations to the event were provided by Adobe, Insomnia Cookies, Lenovo, LinkedIn and Microsoft. 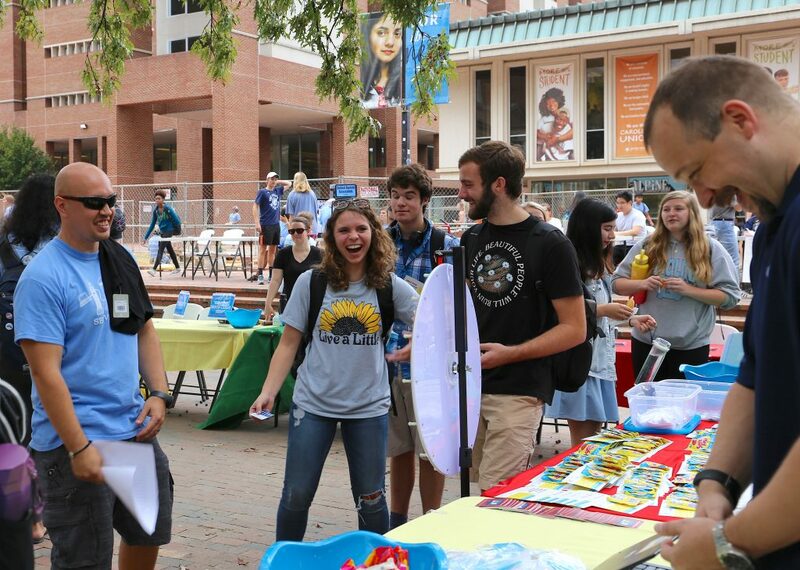 Last year, the 2017 Tar Heel Tech Fair also was a success, attracting an estimated 500-700 attendees and hosting a dozen University departments and vendors. Check out additional photos from the 2018 Tar Heel Tech Fair on the ITS Flickr account.